One of the most popular web hosts for managed WordPress hosting is a service called WP Engine. The service provides a handy, easy-to-use installation utility that’s built right into your account dashboard at WP Engine to allow you to get up and running with WordPress right away. Log in to the WP Engine user dashboard. Browse to WP Engine to bring up the login screen. Enter the email address you used to sign up, enter your password, and then click Log In. The page refreshes and displays the dashboard for your account. Click the Add Install link. The Add Install page displays in your browser window. The Add Install module within a WP Engine account dashboard. 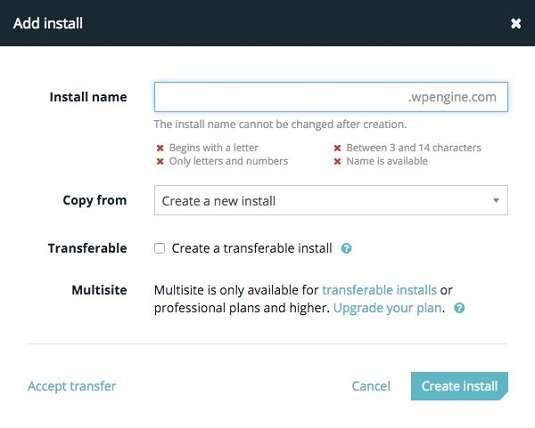 Type the name of your new WordPress installation in the Install Name field. This name is the temporary domain name of your new website. In this image wpfd is being used, which stands for WordPress For Dummies. This step creates the domain name wpfd.wpengine.com. The Add Install page at WP Engine. Choose Create a New Install from the Copy From drop-down list. This step creates a new installation of WordPress in your account. Leave the Create a Transferable Install check box unselected. There may come a day where you want to create a WordPress installation that can be transferred between two WP Engine accounts, but today isn’t that day. Leave the Enable WordPress Multisite check box unselected. For the purposes of basic WordPress installation and setup, don’t worry about this option for now. 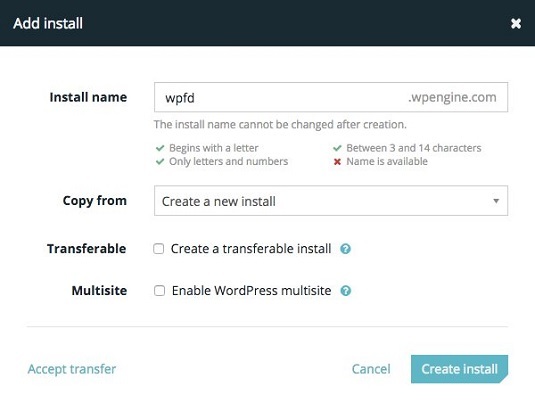 This step creates the WordPress installation in your account and takes you to the Overview page, where a message states that your WordPress installation is being created. When the installation is ready to use, you receive an email from WP Engine. WP Engine always has the most up-to-date version of WordPress available for installation. Be sure to check that your hosting provider is supplying the latest version of WordPress with its installation utility.